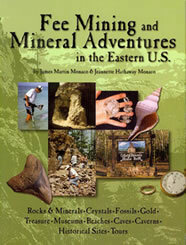 Home » Store » Books » Rocks and Minerals » Fee Mining and Mineral Adventures in the Eastern U.S.
A directory to fee-mining for rocks, minerals, fossils, gold and treasure in the eastern United States. Mineral sites, caves, gold prospecting, mines, festivals, museums, and more. Second edition. 8 1/2" x 10 7/8" paperback, 264 pages.